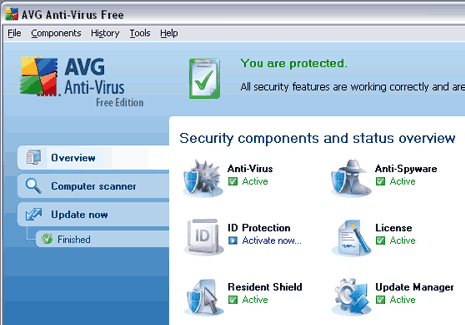 AVG has been best antivirus software among free protection software. New version of AVG 8.5 is now available for free download and use. It works on Windows 7, Vista and XP operating system. It offers free and effective protection against viruses, spyware, adware, trojans and keep system protected. It also provide protection from online threats while you surf your favorite websites. It assign real-time safety ratings for all search results in Google, Yahoo and MSN/Live search for enhanced protection. It screens your downloads and prevents accidental infections through IM chats. It also protect against hidden threats that deliver malicious content. Download AVG 8.5 free antivirus for Windows 7, Vista, XP and stay protected.